Local councils are at the forefront of electric vehicle infrastructure provision, and they play several important roles in the transition to electric mobility. To encourage EV uptake in their locality; with a typical EV causing 3 times less CO2 emissions as their fossil counterparts, switching to EVs is a key means of decarbonising the transport sector. Local air quality is a pressing issue for many urban areas, due to health issues that can arise from particulate and NOx emissions from vehicles. Air quality is also subject to strong standards, with fines for non-compliance. Encouraging EV uptake, above and beyond national averages, could substantially reduce local air pollution. Therefore, installing EV chargepoints is a tangible and visible means of addressing this, as part of wider clean transport measures. 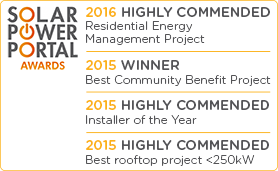 Joju Solar are a key provider of electric vehicle charging infrastructure to councils. We have been selected as a supplier under three of the UK’s most prominent EV charging infrastructure frameworks. Central Southern Regional Framework. This covers an area from Devon to Brighton and up to Oxfordshire, and councils and other public bodies (e.g. emergency services such as Surrey and Sussex Police) in this region can call on Joju to install EV charging infrastructure within their area. Joju are offering both a council funded and 3rd party financed solution here. Transport for London (TfL). Joju have been appointed one of the suppliers on the TfL EV charging infrastructure framework for the provision of on street chargepoints. We have been appointed under the shared supply lot – which means our chargepoints integrate with lamp-post electricity supplies. The chargers themselves can be mounted on or in the lamppost, or on a satellite post adjacent to the lamppost. ESPO framework. We are also a supplier on the ESPO EV chargepoint framework. This is a national framework, which can be accessed by councils all over the country. These frameworks allow councils to proceed more rapidly, without running their own tender process; the due diligence has already been carried out by the framework. Under all these frameworks, Joju operate as technology agnostic suppliers, and experts in the smooth installation and management of EV infrastructure programmes. 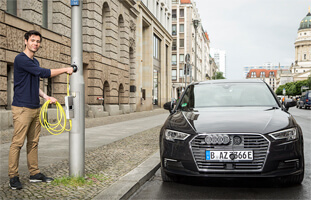 The most common way for councils to install electric vehicle chargepoints is to utilise their own estate of public car parks. Surface car parks and multi-storeys can both be simply fitted with post- or wall-mounted fast chargers. However, 40% of UK residents don’t have a drive way, so they will need some form of on-street public EV charging within residential areas. There are a number of specific products that address this issue directly. 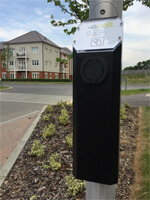 Post mounted chargers – these are standard post mounted fast chargers, which can be fed from a fed from dedicated supply or from a lamppost electricity supply. Lamppost integrated – these are EV charging units where the whole of the charging and control electronics are housed within the lamppost base. As well as out standard wall and post mounted chargers, and rapid chargers, we also offer the following products specifically for council off-street charging. The Cityline 100 is a discreet unit (only measuring 300mm x 140mm x 85mm), which also offers contactless debit/credit card payment functionality alongside RFID and smartphone app in one model. Offering charging up to 7kW, it can be lamppost, column or wall-mounted; has ‘system’, ‘approval’ and ‘charge’ LED indicators, and a vandal resistance rating of IK10. Ubitricity offer the first ELEXON approved lamppost integrated chargepoint in the UK market. They can be fitted onto existing infrastructure, making the cost of additional street furniture unnecessary. We’ve been very pleased with the partnership we’ve built with Joju to install these units – it’s been a seamless piece of project delivery, completed to a very high standard. We were grateful for Joju’s smooth project management [...] they have been extremely straightforward to deal with, and we’ve known exactly who at Joju has been dealing with what. Joju have been brilliant. The whole process worked really well. The only delay in the whole process came from the Government and waiting for approval.